6 in 1 Pocket Screwdriver This custom printed pocket screwdriver is just under 4 inches long and has a pocket clip. 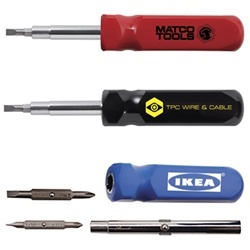 These screwdrivers are available with White Handle, with 5 blade options and over a dozen top options. Heavy duty screwdriver. Includes two dual-ended bits, #1 and #2 Phillips. 3/16" and 1/4" flat reversible shaft doubles as a 1/4" and 5/16" hex driver. Overall Size (approx) Size 7.25" x 1.13"